Happy Holidays to Everybody. 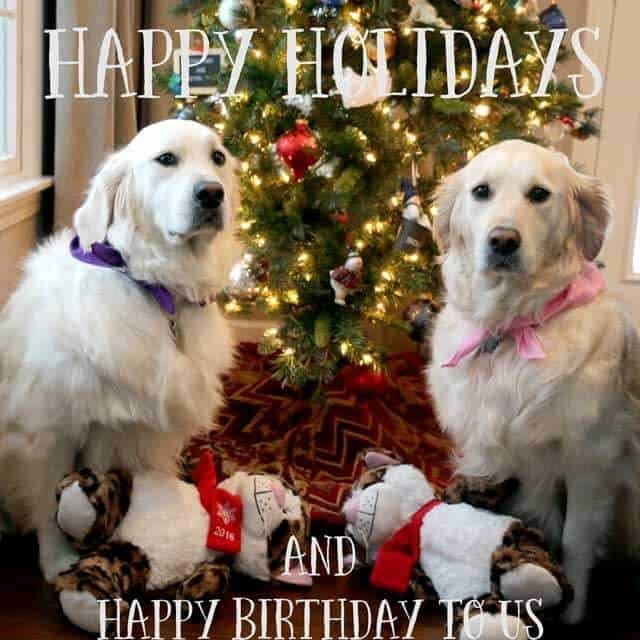 Also, Happy Birthday to our girls Lilly (left) and Molly (right). 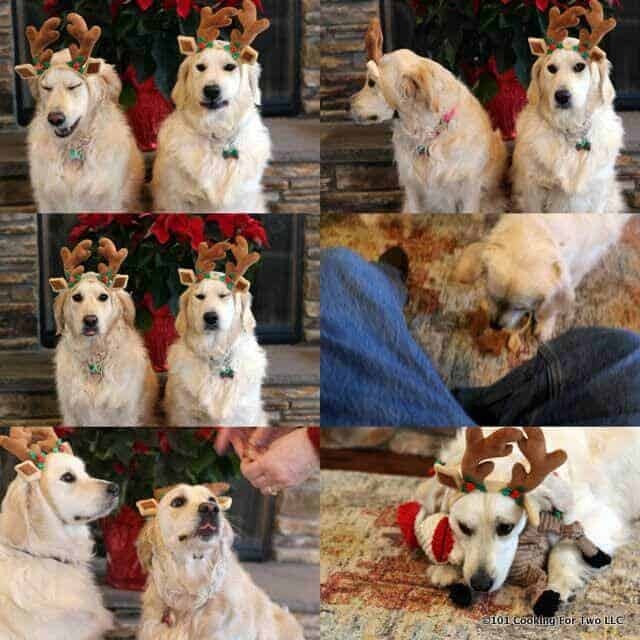 They were born on Christmas Eve 2013. Have a great holiday no matter what holiday you are celebrating this season. Now, I need to work on getting five candles to stick on a dog bone, maybe peanut butter. Editor’s Note: This year, I’m reusing last years picture for a number of reasons. We have no snow, and due to some medical issues, we have minimal decoration. So I have no good setting that for a holiday picture this year. Eye surgery has made editing photos temporarily harder. Last, but by no means least, I think this is one of my best pictures… ever. Look at those smiles. Molly and Lilly at one year of age. Editor’s Note: Originally Published December 23, 2014. Updated yearly, so some comments are older. 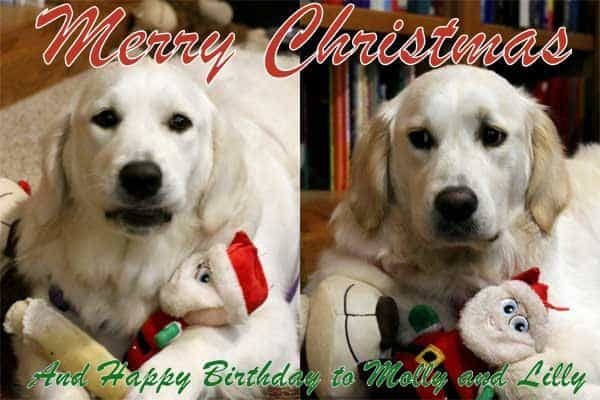 Happy birthday Molly and Lilly! I too was born on Christmas Eve, but I’m a lot older.😂 Merry Christmas and Happy New Year. I’m new to your website and now cooking only for 2. Love it!! Hope you have a speedy recovery from your surgery. Enjoy the holidays and get well soon! Kisses to the puppies. Thanks for the note. The photo editing will probably be about another month. And the girls liked the kiss but they licked me. Love your precious doggies and all your great recipes! Thanks for the prompt response and the suggestion! Am excited to give them a try. Thank you so much–and happy cooking! Those toys are the $5 holidays ones from PetSmart and definitely not for a chewer. Our girls have “gentle mouths” and never destroy larger toys. Smaller ones sometimes. Those are not props but are new so they are clean. The bunny ones I wanted to use were two week old and too dirty. The Santa toy that is also there is three yrs old. There is a brand that we give to people with the dogs that destroy everything, “Fluff and Tuff” about $20 on Amazon. One niece with two large labs which destroy everything. We gave her two. One “died” in 18 months and the second is still “alive” after 2 years. Give them a try. 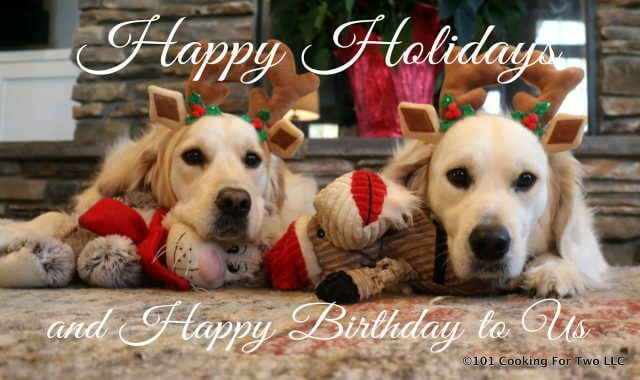 From one English Golden Retriever owner to another, Happy Holidays and Happy Birthday to the sweet babies!! Happy holidays to you and your baby. Happiest Birthdays to the beautiful girls as well! Dr Dan Merry Christmas to you and your family and those beautiful girls, thanks for all the great recipes and tips you share. My sister and her family just got an English Golden Retriever puppy a couple of weeks ago. I imagine he will look similar to yours when he grows up. Have a merry Christmas. I enjoy following your blog on Pinterest. My dog’s birthday is Xmas Eve, too! Love your girls! Merry Christmas! Merry Christmas to all in your family! 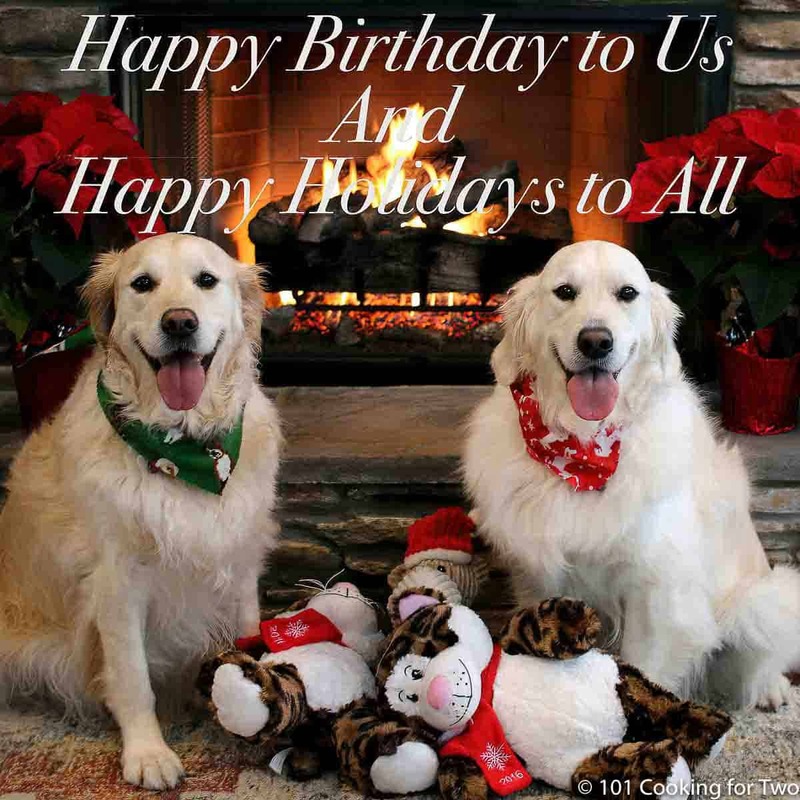 Your great recipes and lovely doggies have been fun this past year. I always look forward to both! Molly and Lilly are very lucky to have such a great Dad! Oh wow! I’ve followed you and enjoyed your recipes for most of this year, and yet didn’t realize your beautiful girls were born on Christmas Eve. Keep those delicious recipes and pics of the gals coming. They always brighten my day.